This is the story about how Wil Wheaton completely flipped out. And it was amazing. How did this happen? Well, in a freak time-fiction accident, Wesley Crusher was ripped from his post on the Starship Enterprise and showed up at Dragon*Con 2011. And by that I mean I spent three months carefully constructing the best Acting Ensign Wesley Crusher cosplay ever made, and then went to Dragon*Con to meet Wil Wheaton. 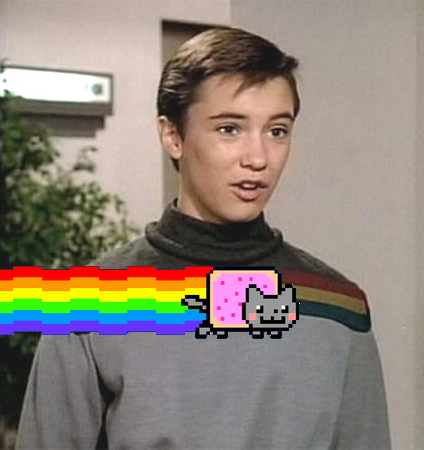 So why Acting Ensign and not the Rainbow Sweater? I hate the rainbow sweater. So this is a two part story. If you want to find out about all the work I had to go through to make an acurate Acting Ensign Wesley Crusher uniform, and how difficult that actually was, you should start with Part 1. If you don’t care about me, or my hard work, and you just want to hear about Wil Wheaton, just skip to the end, and go to Part 2. 1 Some would say he hates Wesley. I think "It’s Complicated" might be more accurate. 2 Fun fact: This party still hasn’t happened yet. So far, it’s been all talk, and no dice. 3 And by love I mean revere and respect from an appropriate fan distance.